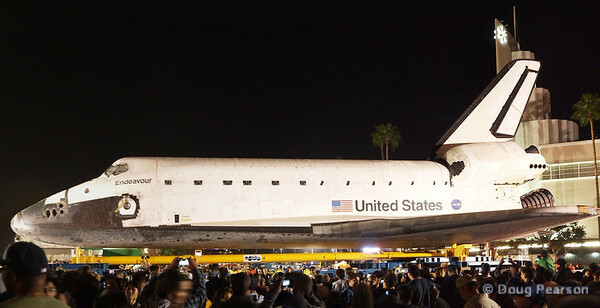 The Space Shuttle Endeavour (OV-105) is retiring to the California Science Center in Los Angeles, California. Endeavour will be on display in the Samuel Oschin Space Shuttle Endeavour Display Pavilion at the California Science Center in Los Angeles, opening October 30, 2012. After 25 trips to space for a total of 296 days on orbit and traveling over 122 million miles through space, Endeavour traveled the last 12 miles though the streets of LA. May 18-22, 2016, External Tank 94 arrives in Los Angeles and is transported to the California Science Center where it joins Endeavour. Endeavour waiting to proceed down Martin Luther King Blvd in Los Angeles while the crowds get a close up view.